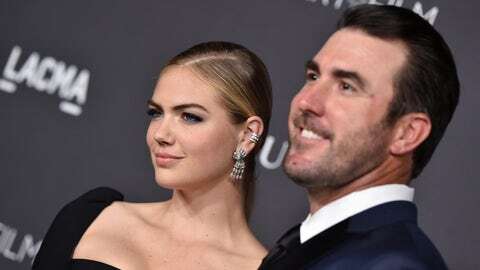 Justin Verlander lost a tight race to the Red Sox's Rick Porcello for the AL Cy Young Award on Wednesday, and many Detroit Tigers fans are not happy about the incident, chief among them: his fiancee, Kate Upton. Yeah. That's not exactly the most, measured response. But it is a response! 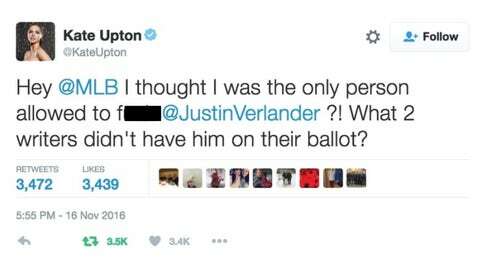 And Upton had more heat in the tweet tank after that. Verlander's brother, Ben, also weighed in on the situation. It's not exactly Upton levels of heat, but it's something. Somebody might need to take Kate's phone. Just for the time being. Dan is on Twitter. Upton funk you up, Upton funk you up.